I hope you had a great start of the year. It is time for me to finally show you what’s inside my bag. It took so long for me to finally be able to post this and now, here it goes! First, let’s start off with my bag. So, I got this medium-sized cross body bag from SM department store for about Php 300+ which I think was really a great bargain. Currently, this is my go to everyday bag. So, what are the bits and pieces inside? Let’s dive right in! Wallet/Purse – This wallet is actually my mom’s. I just used it because I love its classic black design and it is really durable. Pen and Notepad – If I have to take down notes, I like to be ready. And if anyone needs something to write on, they can use mine. Coin Purse – when commuting by jeepney, I like to be prepared. Paying the jeepney fare with bills especially early in the morning is quite a hassle. Earphones – coz duh!? Listening to Boyce Avenue is life! It makes me more productive. Also, Alejandro is bae! Lipstick – I can never go out without one! Not only for lips, but I also use it sometimes as blush. (Maybelline Lipstick in Burgundy Blush) Visit my beauty blog right here. Comb and Hair Tie – because who wants unruly locks? I don’t! Sugarfree Gum – I specifically love these Extra Sugarfree gum. It increases the production of saliva which neutralize plaque acid, wash away food debris, and remineralize tooth enamel to help strengthen our pearly whites. I am also very happy to be able to take part of their EDC (Eat, Drink, Chew) campaign. Alcohol – I am an alcohol freak and I sanitize a lot coz I always get allergies. So, better be ready and safe than sorry. So, that is all for now. 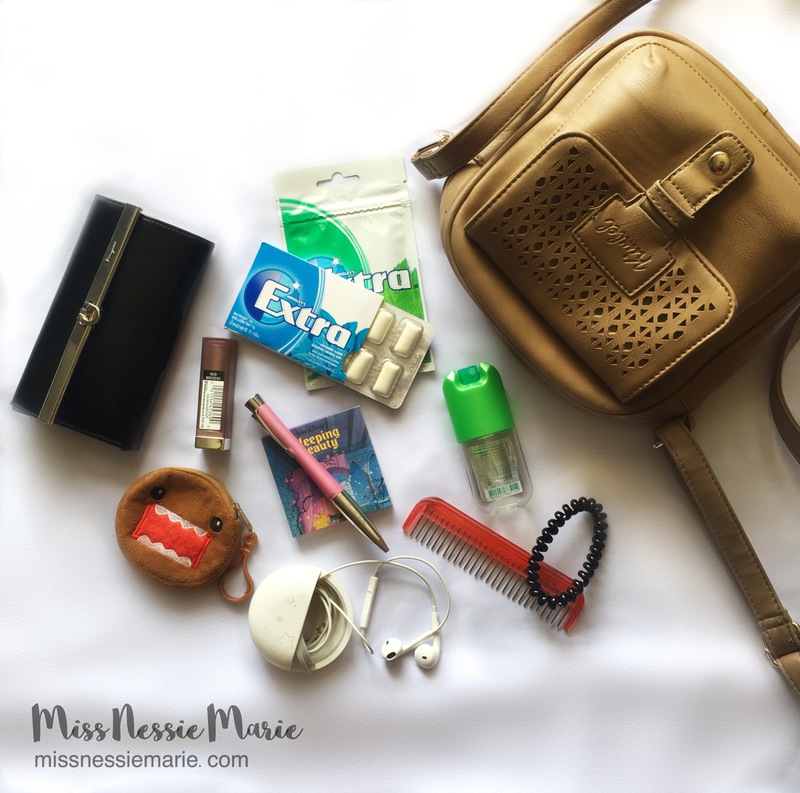 You may leave in the comments the link to your own ‘What’s in my bag?’ posts. I would love to read them.